Could The Transformer be another nail in the coffin for RNNs? Doing away with clunky for-loops, the transformer instead finds a way to allow whole sentences to simultaneously enter the network in batches. With this technique, NLP reclaims the advantage of Python’s highly efficient linear algebra libraries. This time-saving can then be spent deploying more layers into the model. So far, it seems the result from transformers is faster convergence and better results. What’s not to love? My personal experience with this technique has been highly promising. I trained on 2 million French-English sentence pairs to create a sophisticated translator in only three days. You can play with the model yourself on language translating tasks if you go to my implementation on Github here. Also, you can look out for my next post on the FloydHub blog, where I share my journey building the translator and the results. Or, even better, you could build one yourself. Here’s the guide on how to do it, and how it works. The diagram above shows the overview of the Transformer model. The inputs to the encoder will be the English sentence, and the 'Outputs' entering the decoder will be the French sentence. Embedding words has become standard practice in NMT, feeding the network with far more information about words than a one-hot-encoding would. When each word is fed into the network, this code will perform a look-up and retrieve its embedding vector. These vectors will then be learnt as a parameters by the model, adjusted with each iteration of gradient descent. The embedding vector for each word will learn the meaning, so now we need to input something that tells the network about the word’s position. This constant is a 2d matrix. Pos refers to the order in the sentence, and i refers to the position along the embedding vector dimension. Each value in the pos/i matrix is then worked out using the equations above. The positional encoding matrix is a constant whose values are defined by the above equations. 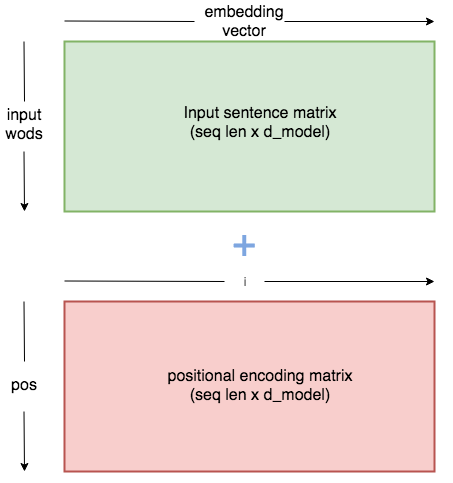 When added to the embedding matrix, each word embedding is altered in a way specific to its position. The above module lets us add the positional encoding to the embedding vector, providing information about structure to the model. The reason we increase the embedding values before addition is to make the positional encoding relatively smaller. This means the original meaning in the embedding vector won’t be lost when we add them together. In the encoder and decoder: To zero attention outputs wherever there is just padding in the input sentences. In the decoder: To prevent the decoder ‘peaking’ ahead at the rest of the translated sentence when predicting the next word. The initial input into the decoder will be the target sequence (the French translation). The way the decoder predicts each output word is by making use of all the encoder outputs and the French sentence only up until the point of each word its predicting. When the mask is applied in our attention function, each prediction will only be able to make use of the sentence up until the word it is predicting. If we later apply this mask to the attention scores, the values wherever the input is ahead will not be able to contribute when calculating the outputs. Once we have our embedded values (with positional encodings) and our masks, we can start building the layers of our model. 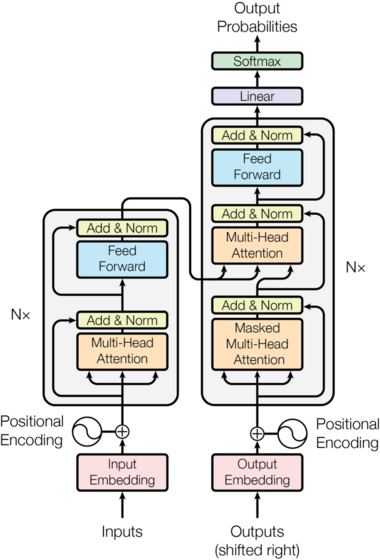 Multi-headed attention layer, each input is split into multiple heads which allows the network to simultaneously attend to different subsections of each embedding. V, K and Q stand for ‘key’, ‘value’ and ‘query’. These are terms used in attention functions, but honestly, I don’t think explaining this terminology is particularly important for understanding the model. In the case of the Encoder, V, K and G will simply be identical copies of the embedding vector (plus positional encoding). They will have the dimensions Batch_size * seq_len * d_model. 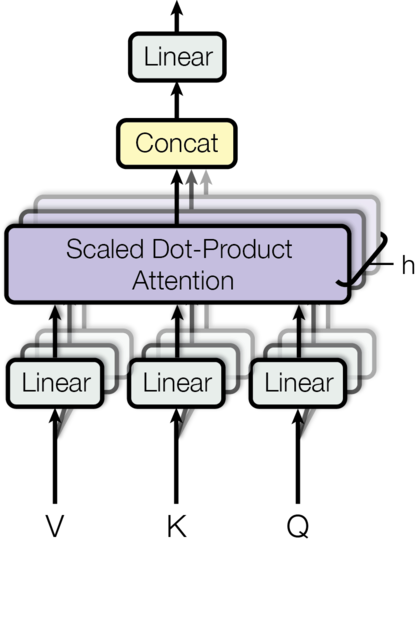 In multi-head attention we split the embedding vector into N heads, so they will then have the dimensions batch_size * N * seq_len * (d_model / N). This final dimension (d_model / N ) we will refer to as d_k. This is the only other equation we will be considering today, and this diagram from the paper does a good job at explaining each step. Each arrow in the diagram reflects a part of the equation. Initially we must multiply Q by the transpose of K. This is then ‘scaled’ by dividing the output by the square root of d_k. A step that’s not shown in the equation is the masking operation. Before we perform Softmax, we apply our mask and hence reduce values where the input is padding (or in the decoder, also where the input is ahead of the current word). Another step not shown is dropout, which we will apply after Softmax. Finally, the last step is doing a dot product between the result so far and V.
Ok if you’ve understood so far, give yourself a big pat on the back as we’ve made it to the final layer and it’s all pretty simple from here! This layer just consists of two linear operations, with a relu and dropout operation in between them. The feed-forward layer simply deepens our network, employing linear layers to analyze patterns in the attention layers output. 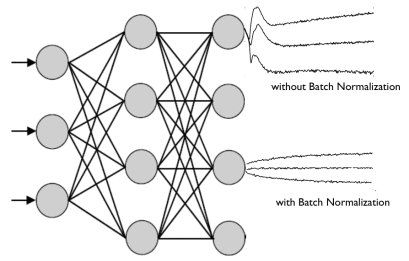 Normalization is highly important in deep neural networks. It prevents the range of values in the layers changing too much, meaning the model trains faster and has better ability to generalize. If you understand the details above, you now understand the model. The rest is simply putting everything into place. One last Variable: If you look at the diagram closely you can see a ‘Nx’ next to the encoder and decoder architectures. In reality, the encoder and decoder in the diagram above represent one layer of an encoder and one of the decoder. N is the variable for the number of layers there will be. Eg. if N=6, the data goes through six encoder layers (with the architecture seen above), then these outputs are passed to the decoder which also consists of six repeating decoder layers. We will now build EncoderLayer and DecoderLayer modules with the architecture shown in the model above. Then when we build the encoder and decoder we can define how many of these layers to have. With the transformer built, all that remains is to train that sucker on the EuroParl dataset. The coding part is pretty painless, but be prepared to wait for about 2 days for this model to start converging! # range of values that stops the signal fading or getting too big. # See this blog for a mathematical explanation. We can use the below function to translate sentences. We can feed it sentences directly from our batches, or input custom strings. The translator works by running a loop. We start off by encoding the English sentence. We then feed the decoder the <sos> token index and the encoder outputs. The decoder makes a prediction for the first word, and we add this to our decoder input with the sos token. We rerun the loop, getting the next prediction and adding this to the decoder input, until we reach the <eos> token letting us know it has finished translating. And that’s it. See my Github here where I’ve written this code up as a program that will take in two parallel texts as parameters and train this model on them. Or practice the knowledge and implement it yourself! Build an English-French language translator from scratch using PyTorch. Learn techniques for identifying the best hyperparameters for your deep learning projects, including code samples that you can use to get started on FloydHub.